The past two years in the US we have seen near epidemic proportions of hospitalizations and deaths from the flu. The number of pediatric deaths reported from the 2015-16 flu season was 110. Deaths rose sharply in the 2016-17 season to 178. “A total of 169 influenza-associated pediatric deaths for the 2017-2018 flu season have been reported to the CDC”.1,2 “They” are predicting another bad flu season this year. The flu can be challenging to treat especially in the very young and the very old. Natural medicine generally, and homeopathy specifically, provides numerous tools in the proverbial medicine “tool box” to prevent and treat the flu. My “go to” homeopathic remedy for the flu is called Oscillococcinum. It has been studied for years in a number of countries. A randomized, double blind, placebo controlled study done in France on 487 people found Oscillococcinum to be more effective than placebo. The study results were published in the British Journal of Clinical Pharmacology in 19894 and was referenced by Britains highly regarded medical journal the Lancet.5 In 1999, a German study on 372 people found similar results.6 Oscillococcinum is not designed to be used to prevent the flu. It works best to treat the flu when taken with 48 hours of the onset of symptoms. 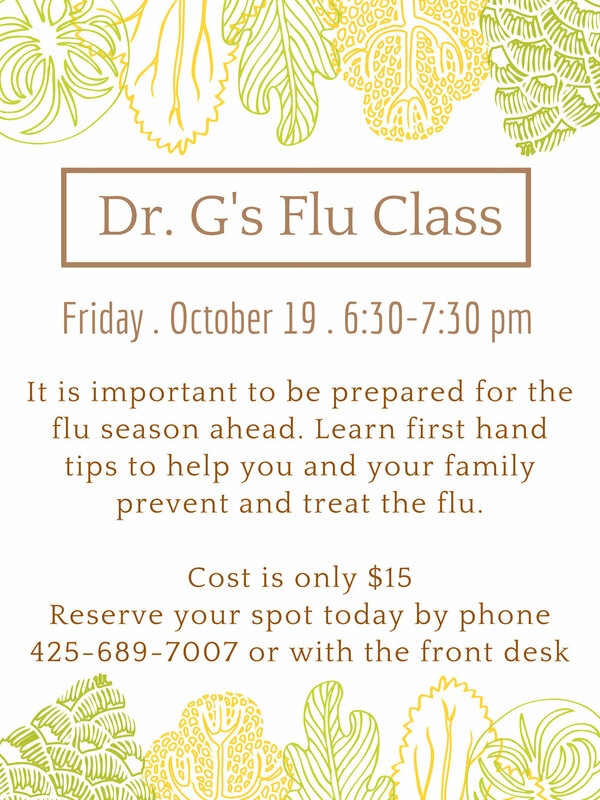 For more information on preventing and treating the flu with natural medicine consider attending Dr. Gonzalez’ class on Friday October 19th from 6:30 to 7:30 pm at Serene Natural Health. Please call 425.689.7007 to reserve your spot. Cost of the class is $15.00. 4. Ferley J.P., Zmirou D., D’Adhemar D., Balducci F. A controlled evaluation of a homeopathic preparation in the treatment of influenza like syndromes. British Journal of Clinical Pharmacology 1989; 27:329-333. 5. Anonymous. Quadruple-blind. The Lancet 1989; Apr 22: 914. 6. Papp R., Schuback G., Beck E., Burkard G., Bengel J., Lehrl S., Belon P. Oscillococcinum in patients with influenza like syndromes: a placebo controlled double blind evaluation. British Homeopathic Journal 1998; 87: 69-76. Join us for more tips!